When it comes to having a beautifully clean and sanitized floor, the The Hoover WH20200 TwinTank Steam Mop is definitely the mop for you. This Hoover mop is a very lightweight mop that can easily steam clean a floor in no time. Not only will the steam help loosen up nasty stains and crud that’s built up on your floors over the years, but it will also destroy up to 99.9% of the germs on your floors! 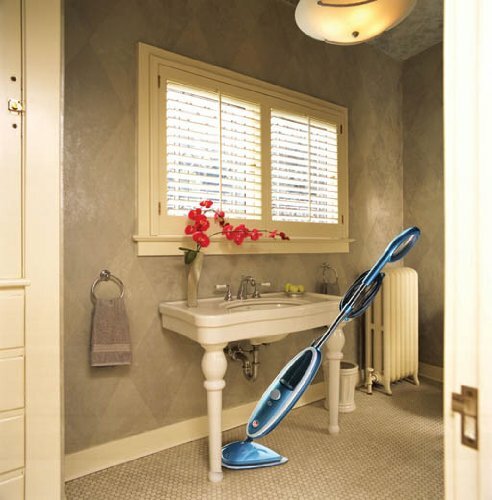 This The Hoover WH20200 TwinTank Steam Mop can handle linoleum floors, wood floors, stone floors, and even carpets! Additionally it uses a non-toxic cleaner that helps give an extra boost to its cleaning abilities! Very light weight makes for easy use even over long periods of time. Very easy assembly. Basically the handle snaps into the base unit. Independent tests by consumers show that, while branded disinfectant cleaner is somewhat expensive, it lasts a long time. Replaceable cleaning pads are very easy to exchange yet hold in position quite well. Very little chance of pad accidentally coming off even with rigorous use. The micro filter pads are reusable and can be machine washed although a thorough hand washing is also sufficient so long as the pad is dried flat. One-step steam cleaning begins quickly; usually within 30 seconds of switching machine on. Conveniently positioned dial switches from steam cleaning to disinfectant mode quickly. Very long (28 foot) power cord allows full room cleaning without having to switch electrical outlets. Tray is provided to set the cleaner on if work is interrupted as floor surface could be damaged if unit is allowed to sit idle without taking precautions. Triangular steam cleaning head is well designed for fitting into corners and along baseboards for complete floor coverage. Excellent limited two year warranty and customer service from Hoover. Trigger must be depressed to produce steam which fatigues the hand. There is no mechanism for holding trigger in the “On” position except manually. Must read Use Instructions, especially for mixing liquids. Machine is not intuitively designed. Manual is 14 pages long. Flooring must be “pre-cleaned” or swept before use to prevent clogging of steam vents. The head is a little large so you might have problems getting into very narrow places.